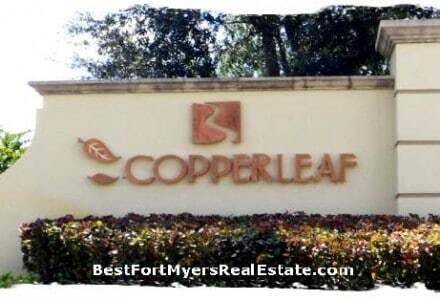 Copperleaf at the Brooks Bonita Springs, FL 34135 is a bundled golf gated community. Copperleaf offers maintenance free single family villas, executive homes and carriage homes. Copperleaf Country Club is an rich, relaxed community which offers members a fun and a dynamic social life. Want to golf? Membership in the Copperleaf Country Club is included in the purchase of property in Copperleaf. Members pay annuyal dues to the Copperleaf Homeowners Association for the use of the club amenities. The include Copperleaf The Brooks amenities, An 18 hole championship golf course professionally designed by Gordon Lewis. Aquatic driving range and practice putting green top it off. An over 15,000 square foot clubhouse with formal room, bar with fireplace, meeting space, a complete pro shop. Also men’s and women’s locker areas. A four court tennis facility. Copperleaf at The Brooks is a low density, golf inclusive community, more [commonly know as Bundled Golf in Florida. Copperleaf offers and attractive lifestyles offering s maintenance free single family villas, executive homes and carriage homes. Real estate in Copperleaf at The Brooks is available in three structure styles: Executive Homes, Single Family Villas, and Carriage Homes.